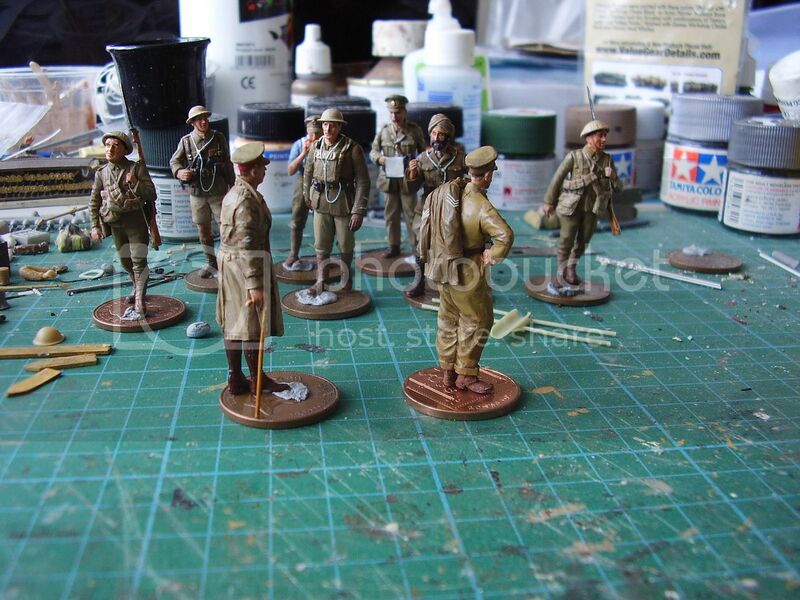 I was surprised when I checked the review section on D Day Miniatures and found that this will be the first on site review of any of their figures as I am aware they have had some excellent past releases. I was delighted to see the arrival of some new WW1 troops in 1/35th scale, and I hope we will see more in the future. The figures were sculpted and painted by Pawel Krasicki with whom many of you I am sure are familiar. This is a look at set 35402, the combined Officer and NCO figure set, but these are available as separate items if needed. The set comes packed in a smart cardboard box with a colour label showing the completed figures and product and manufacturer details. The figures come packed within small plastic zip bags and are cast in a light grey resin. I could see no sign of any air bubbles or damage to the castings. The set consists of two standing figures of the British Tank Corps in WW1; an Officer and a NCO. The figure consists of 4 parts, the body as a whole, separate head and left and right hand. The left hand holds a cane/walking stick. The figure wears a collar and tie, open necked stepped collar jacket and Sam Brown belt, Bedford cord breeches and lace up boots with 3 strap gaiter type fastenings at the top. Over the jacket the figure wears a WW1 Officer Khaki Canvas Trench Coat worn open at the front with the collar turned up.. The uniform is really nicely done with nice folds and creases; from the trench coat to the part Sam brown and Officers Jacket detail is excellent. The head, a separate item wears a nice Officers Cap, with Regimental Badge and leather strap. The side brass buttons for the strap are present. The face is that of a mature man and sports nice moustache. Detail is excellent. Both hands are separate items and very well sculpted with the left hand holding a walking stick. This figure really looks the part. The NCO is made up of 5 parts. The body comes as a whole with separate arms and head being provided along with a separate soldiers tunic jacket that is slung over the left shoulder. The figure is dressed in coverall/overalls as issued to tank crews. Under the overall is a shirt and tie. Around the waist is a leather belt with a pistol holster and ammo pouch attached. The S brasses and buckles on the belt and holster are all really nicely done. A pair of ammo booths completed the dress for the NCO. The two arms are separate items, one designed to hold the soldiers jacket over the left shoulder and the other to rest on the right hip. The jacket looks good and has Cpls chevrons on each arm. The head also a separate item wears a soldier cap, again nicely done with Regimental Badge etc. The face shows that of an older soldier and again sports a moustache and quite large eyebrows. As with the Officer figure the detail on the NCO is excellent. The body proportions of both figures look good and from heel to shoulder measure in at about 43 mm so should fit well within the 1/35th scale range. With the recent release of the new Mk IV tanks these should prove to be very useful figures, but whether completed as a standalone figure or with a vehicle these two figures should give a lot of pleasure to both figure builders and model makers alike. The detail is excellent, clean up should be minimal with only the removal of the pour stubs. The build should be simple and which allows you to get to the fun part quickly. with nice sharp detail a very pleasing result should be achievable. Two excellent products that I’m looking forward to building and painting, a very welcome addition for British WW1 modellers and to D Day Miniatures growing range of figures.